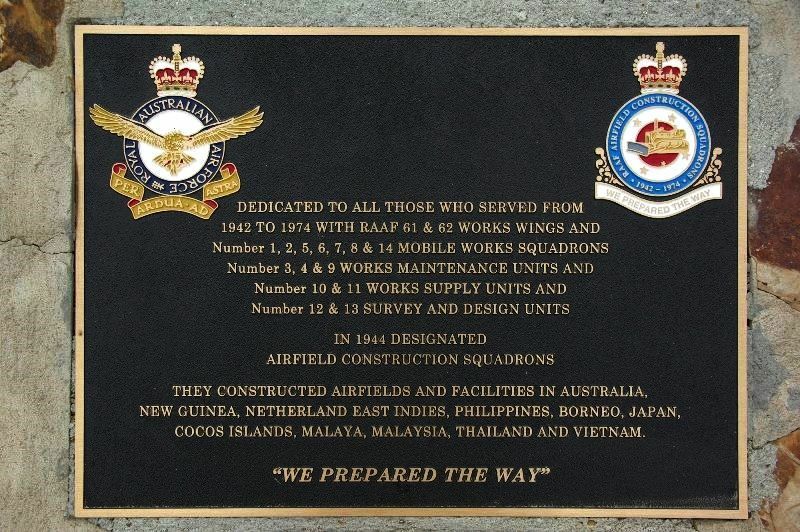 A plaque commemorates those who served with the Royal Australian Air Force Airfield Construction Squadrons during World War Two. THEY CONSTRUCTED AIRFIELDS AND FACILITIES IN AUSTRALIA, NEW GUINEA, NETHERLANDS EAST INDIES, PHILLIPINES, BORNEO, JAPAN, COCOS ISLANDS, MALAYA, MALAYSIA, THAILAND AND VIETNAM.
" WE PREPARED THE WAY"